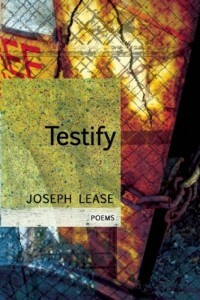 In his latest collection, Testify, Joseph Lease pulls words from a wide stream of diction, using vastly different textures to make the fullest contact with his readers. Re-casting lines from multiple news sources, Lease sets up the problematic linguistic backdrop of the current media and the gaping lack of a faithful source of social, economic, or political truth. The action of writing, even the intention to “turn off the shooting try our new / daydream and / try our // new rights,” offers an intervention, an alternative to the automatic moving walkway that propels us always in the direction of consumerist distraction, militarized deception and political numbness. From this first line Lease roots down immediately in both body and voice. His focus on effort and embodiment in the face of disorientation, dismay and deception, creates a space for shared experience and hope. Beyond the profound and unanswerable questions they raise about the purpose of life and about desire, these missives seem also to answer them by offering a handmade reaching out to each and every one of us. Lease’s poetry enacts the questioning, challenging plea of a speaker struggling to stay connected to his own judgement, his faith in humanity, in the power of the collective to feel, recognize itself and act. This work, among the best poetry of our time, is full of conflict, contradiction and the vitality of thinking. That is, thinking while feeling while thinking and trying to sift through it all, and back, finally, to some enduring shelter in a self-aware language. Jesse Nissim is the author of Day cracks between the bones of the foot (Furniture Press Books), SELF NAMED BODY (Finishing Line Press), and Alphabet for M (Dancing Girl Press). Her poems have appeared in 26, Barrow Street, Court Green, ecopoetics, H-NGM-N, New American Writing, Requited, RHINO, La Petite Zine and others.